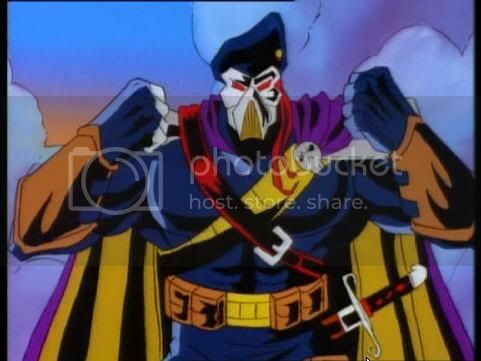 IRON KLAW : DECLASSIFIED- BLOOD FOR THE BARON!!! 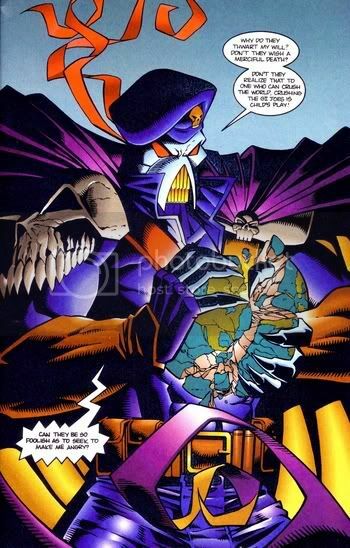 Not only does he kill the real Count Von Rani (see the comic reviews) and then pose as him for the entire first season (and all the comic issues) but he is also shown to pose as a U.S. General (in Flashbacks) who runs a TOP SECRET U.S. plan to create the ultimate soldier. 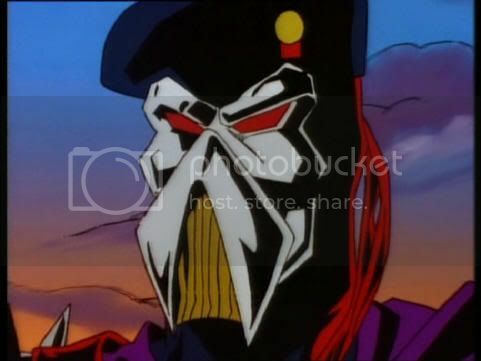 Then in the finale episode of season one he then takes Clancyâ€™s identity and poses as him in the first half of the second season and he is running the G.I. JOEs. 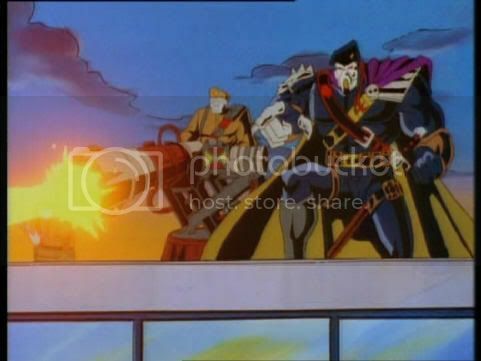 He impersonates a U.S. General, a leader of a country, and then as the Joes own Liaison officer. He is also a great hand to hand combat fighter as well. 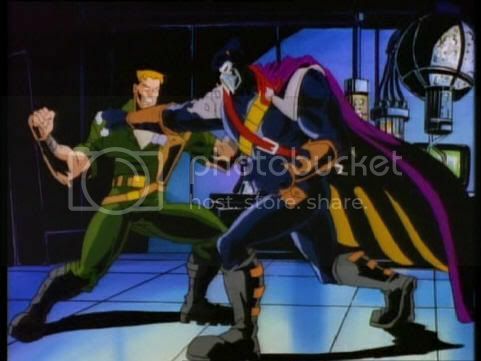 In the first season he goes fist to fist with Lt. Stone twice and in the finale second season episode Betrayal he takes on Black Dragon in hand to hand combat, who according to his own file card is the ultimate ninja. 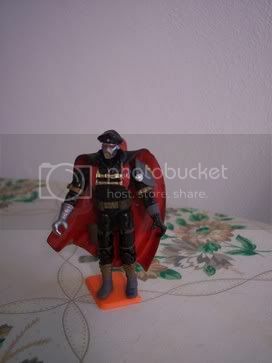 Has a passion and hobby of collecting Genghis Khan items. He even has a small shrine like, set up, built for Genghis Khan in his Cave Headquarters. 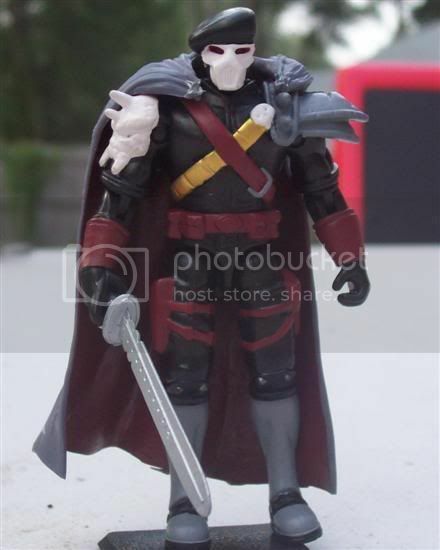 According to scripts of the show he has Genghis Khans Sword, that he carries with him and he even once had Rampage locate the frozen corpse of Genghis Khans General in the episode Relics. 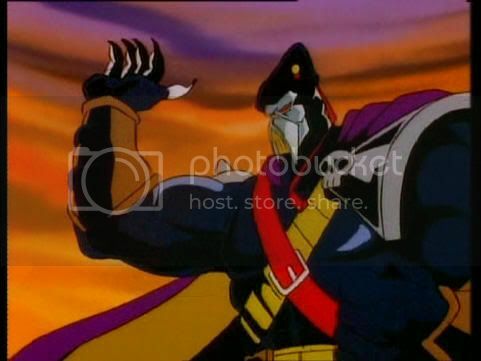 What is revealed to be a little scarier about S.K.A.R in the second season is Iron Klaw is actually, (to be precise) the Military leader of S.K.A.R. so he is in charge of their military operations. S.k.a.r. is the ultimate conspiracy theorist worst nightmare. A group of men in all powerful positions, all over the world, in the governments planning and plotting how to overthrow governments and create anarchy. They were the ones responsible for freeing Rampage and wanting him to run for the president of a small 3rd world country that was running elections. 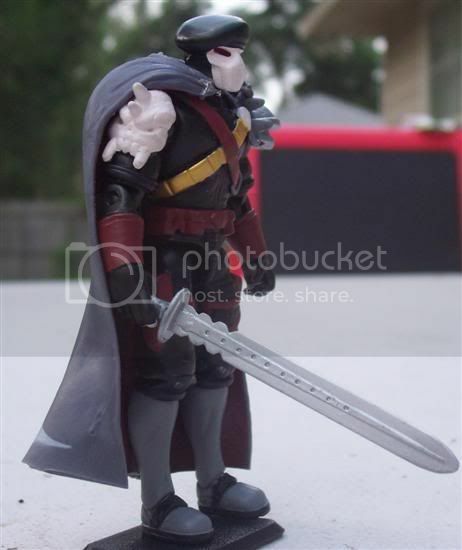 Iron Klaws most trusted General is Steel Raven her loyalty to him is absolute. 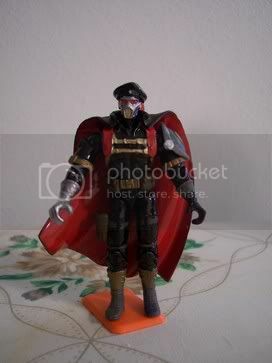 He is also rumored to be romantically involved with Steel Raven. 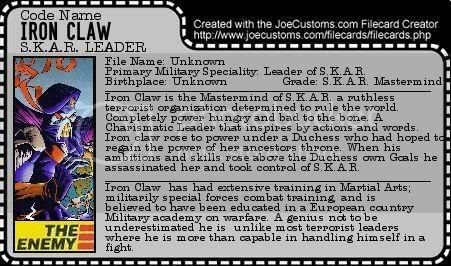 Iron Klaw was trained directly by the Duchess of Mklavia (the possible mother of Steel Raven) as her second in command, he would later Kill her and assume control of S.K.A.R.s military arm and make it a force to reckoned with on a world scale. While the Duchess of Mklavia had her sights only on europe Iron Klaws vision has the whole world bowing down to S.K.A.R. 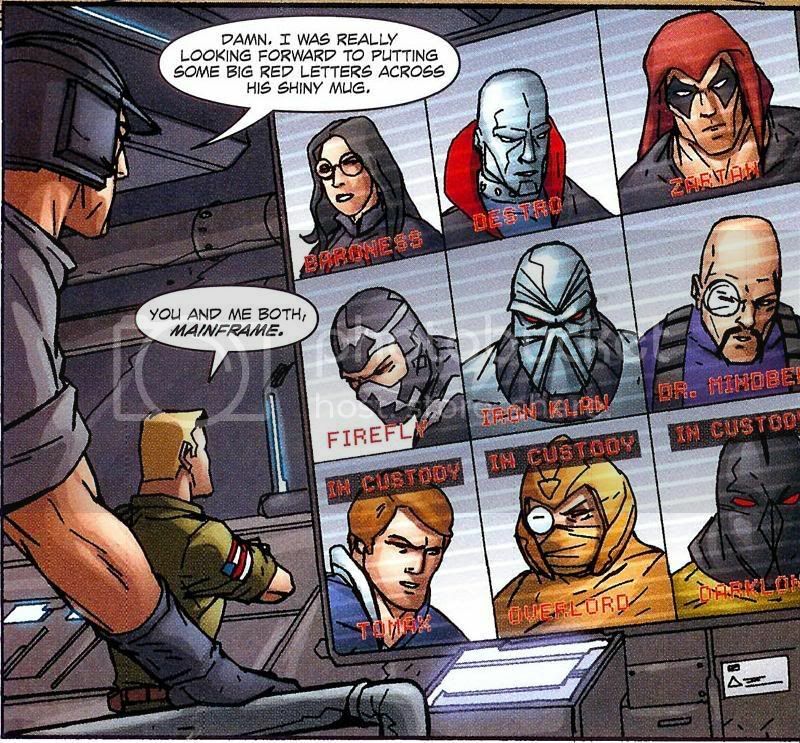 Both in the Comic and TV show Iron Klaw is last seen being taken a prisoner or in Jail. 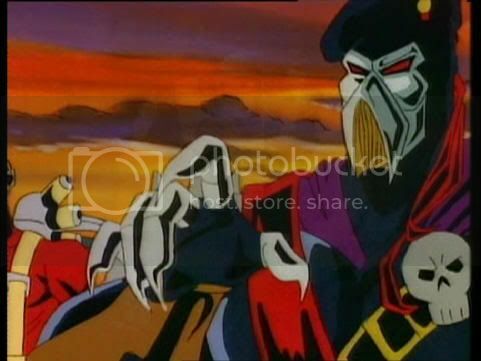 Special notes: Voiced by Richard Newman who also voiced Rhinox in Beast Wars and Vector Prime in Transformers Cyberton. and again the Skeletons face is back. Yuck! I so want this! 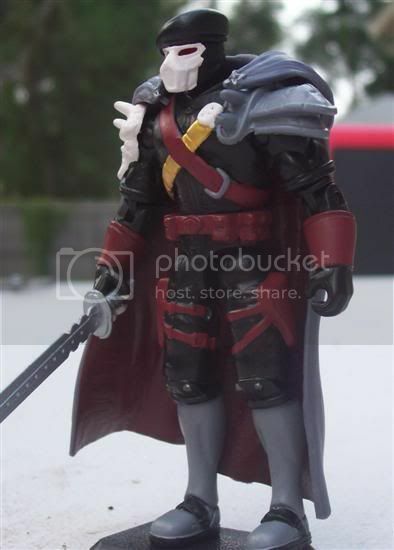 LOL HASBRO PLEASE GIVE US THIS! .................................................and I just bought it ! 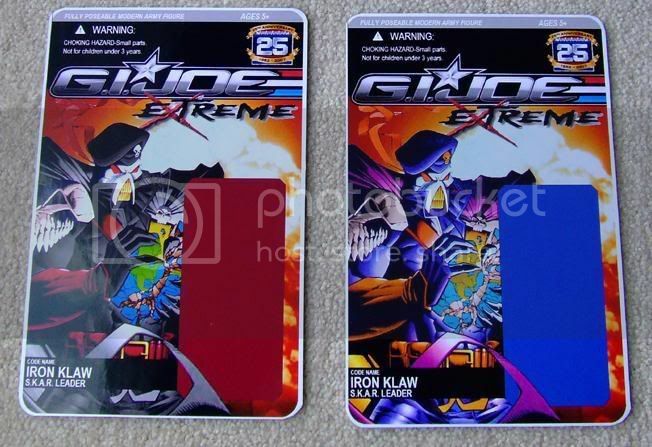 now everyone.................looking at this, who wouldnt want a IRON KLAW toys !!! 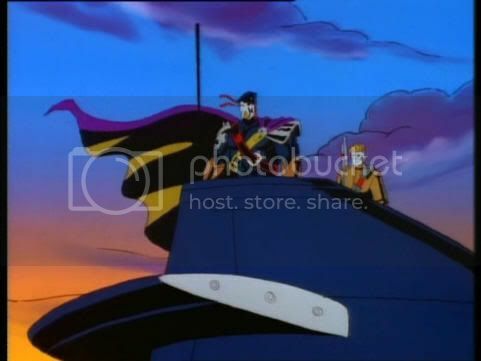 Cool, i always like Sgt Savage, Iron Klaw's my fav villian. 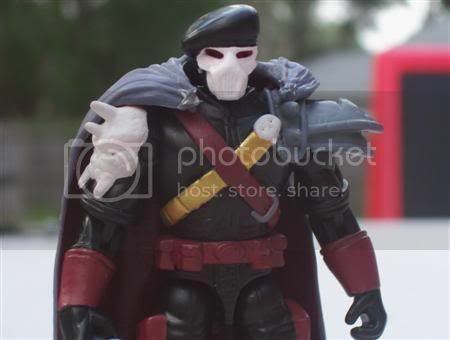 man please hasbro please release this, ill buy 10 at least! Im actually kind of encouraged by peoples post over there, MOST ( not all ) WANT him! Wow! I'd want to see that Iron KIlaw released. seriously if hasbro doesnt then the CLUB HAS TOO! 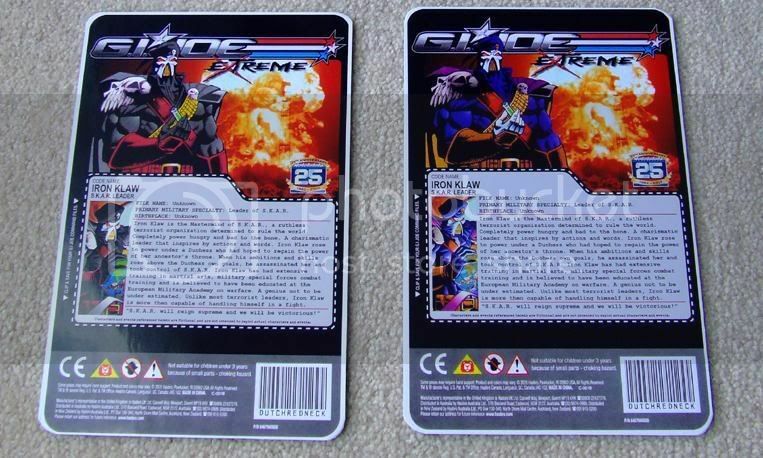 So, ridicule me if needs be, but are GI Joe Extreme the same scale as GI Joe?